A few years before Audrey was born, I had a blank canvas made in the hopes that I would have time to create my own artwork. I was planning on making a painting using acrylic on canvas and tried to get my husband on board - thinking of concepts and ideas for this piece. But then we got so caught up with traveling, fixing our home, and then preparing for the coming of our first baby. And the canvas remained blank for a while as it was kept in the storage room. Last year before Audrey's birthday, I had the canvas taken out and we finally hung it on our living room wall. It was empty only for a short time because after Audrey's party at home, it suddenly became Audrey's canvas. 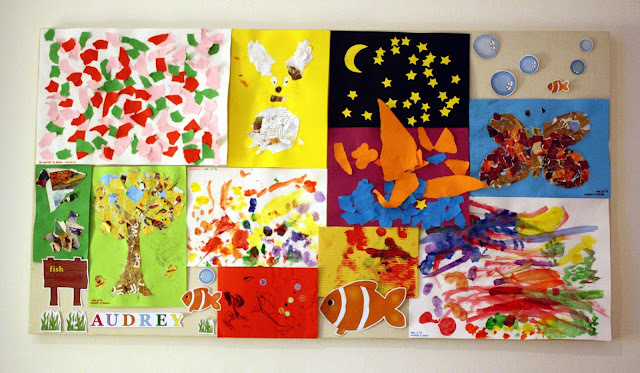 We started sticking the clownfish, bubbles, seaweed and decorations that I drew up, printed out and cut on this canvas. They were originally stuck to the wall as our party decor and Audrey enjoyed taking them off and sticking them to the canvas. And so almost every day, we would see different layouts of fish and bubbles on it.